We’re all trying to avoid a saggy rear end, so I finally installed the Hellwig 61902 Pro-Series Helper Springs with Silent Feature. These were straight forward to install without raising the truck or removing the wheels. The installation took me about 90 minutes but would have been far less with the proper tool – namely an appropriate socket for my torque wrench. Instead I was forced to tighten all the screws using an adjustable wrench because I couldn’t invest the 20 minutes driving to AutoZone. Brilliant. I simply followed the instructions and installed the springs to their minimum tension. I only have one set of measurements so far but the result is that the rear wheel arches are 3/4″ higher than the front wheel arches with the Airstream in tow. This is the best measurement I have ever taken, in contrast to previous results. You can see from the table above that switching from 800 lb. to 1,200 lb. trunnion bars on my Reese hitch did level the load by forcing more weight to the front. Compare the first and second readings and note in the second that the back end is higher and the front end lower than the first reading. The third reading shows the effect of adding the springs. You see the front springs remain more compressed due to the 1,200 lb. bars, but the rear springs compressed about an inch less than before due to the Hellwig helper springs. These results are an imperfect test. The first two readings were taken on a “full-time” load out. The second reading on a “weekend” load out. Imperfect but I believe still valid. Almost all the weight difference would be found in the trailer itself and even a few hundred pounds more in the trailer would result in something fairly trivial on the tongue due to leverage. So the effect on rear axle load should be marginal. So I am confident the springs are effective. There is a lot more room for tightening should the load increase substantially. It’s important to note that I am attempting to ensure a level load to reduce headlight glare to oncoming traffic. I am not attempting to exceed the rear GAWR. One final quick technique you can use to assist with leveling: inflate the rear tires 5 PSI over the front tires, ensuring the tires remain within the manufacturer’s maximum pressure. Below are the steps I take to winterize after each trip. I perform these steps at the campsite before leaving. I have gone through this routine about a half dozen times this season with only one failure – in one instance I forgot to purge and add anti-freeze to the toilet causing a small and inexpensive plastic valve at the back to break. Don’t forget the toilet! I have this down to about a 20 – 30 minute process. My instructions are below. For items that may benefit from a bit of visualization, photographs are inline. 1. Turn off hot water heater (switch probably in the bathroom). 2. Run hot water until cold. 3. Disconnect city water line. 4. Remove water filter (under the galley sink). 5. Open low point drains. 6. When low point drains stop flowing, close again. 7. Open faucet and turn to hot (nothing will flow). This prevents the hot water tank from “gulping” as you drain it. 8. Open hot water tank from the outside – stand to the side! Leave this open while being transported and stored. The 3/4″ drain plug can be difficult to wrangle due to its extraordinarily bizarre placement. I use pliars. 9. Once hot water tank is drained, close bypass valve and close faucet previously opened (step 7). This valve is located by the hot water tank which, in the 28′ International, is under the front couch next to the sink. Note the winterized and non-winterized position – it will be marked next to the valve. 10. Hook up air compressor – set to 50 PSI. In the photograph above you will see my Bostitch pancake compressor attached to my water hose using a Camco Blow Out Plug. 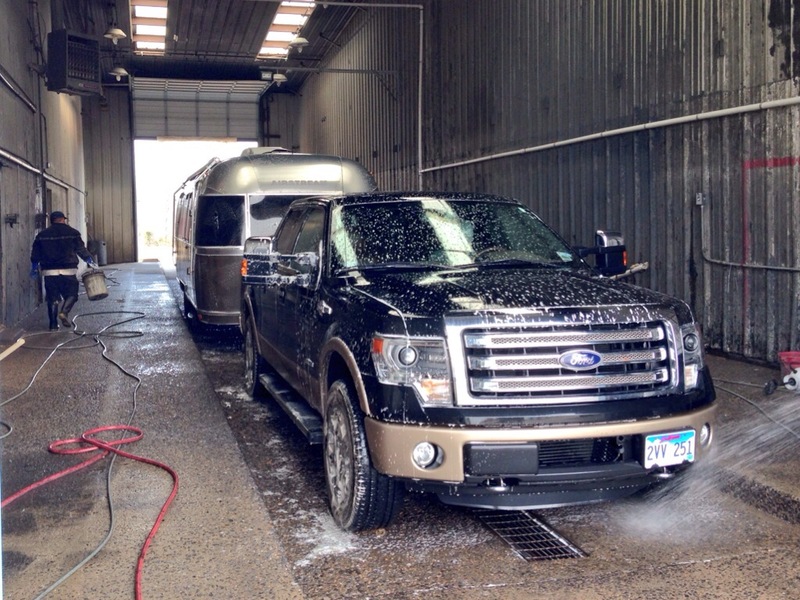 This purges the hose as well allowing it to be stored safely in the Airstream. 11. Go back inside, open up all faucets (including toilet and shower) one by one and purge. Repeat as necessary. You’ll probably be surprised how much water comes out. 11(a). You may need to do this for the outside shower as well unless you have previously winterized this. 11(b). You should purge the black tank flush intake as well. Do this once at the beginning of winter and don’t bother flushing the black tank for the remainder of winter. 12. 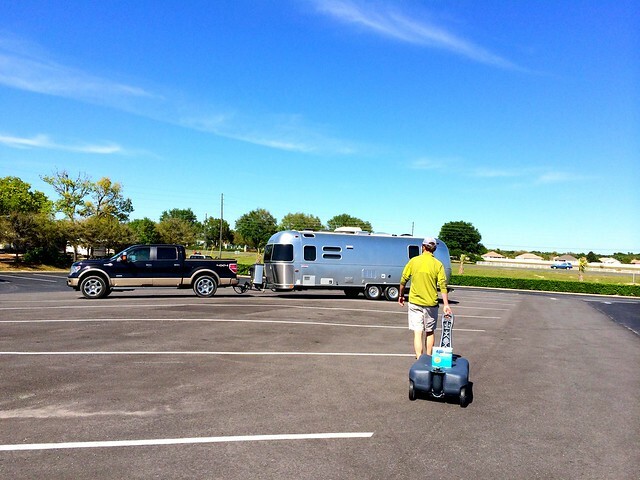 De-pressurize compressor & detach from Airstream. 13. Open faucets and de-pressurize the system. 14. Attach anti-freeze hose line to anti-freeze. In the photograph above you can see a cheap Camco 36543 winterizing kit installed. This is a one minute install. Just leave it in place forever once installed. 15. Turn on pump. Run faucets (including toilet and shower) one by one until pink comes out. Do not forget the toilet! 15(a). Do this for the outside shower as well. We avoid using the outside shower in winter after it has been winterized. 16. Put a cup of anti-freeze down all sinks, showers and into toilet bowl.This prevents (in theory) the rubber toilet bowl seal from drying out and cracking. 17. Re-open low drains and leave open while being transported and stored. 18. Drain fresh water tank (pepcock between wheels on road side) and leave pepcock open while being transported and stored. 19. Dump black and grey tanks. You may have to shovel out the dump station. A nice video on this topic here, showing location of the low point drains and fresh water tank drain pepcock. The weather has finally turned and today we made a short move from Lake Dardanelle State Park to Petit Jean State Park. Last week we resolved not to attempt another winter north of Ft. Smith. It can be done and we have done it, but it’s not what we’re doing this for. So we took the opportunity this weekend to have a quick spring clean. Our rig is lighter 12 items, including a pair of crutches and an old shower head. These are a few other things we didn’t need: a 5 gallon water container; an Hitachi cordless drill with scissor jack socket (heck yes I’m using a drill to raise my stabilizing jacks); more than one space heater, a heat gun and variety of insulation; a toaster; an Harmony remote; ugly pants; many chopping boards; an iron and ironing board.